This is a silly introduction to the last two special tracks Rick and friends laid down in what Rick calls "Swami Bows" to Uncle Al and I for the years of support and friendship. Both of us are very honored. Ex-Woodies recorded this honoria to me, which I am humbly flattered by. Rick's surf writing is still in tact. 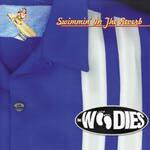 He chose to use a more agreesive tone, which gives this the air of a Surf Trio presentation of the Woodies extreme prowess. The jungle noises are so exotica, and the tribal rhythm is so infectious... A splendid tune. Country riffs, playful tones hinting of chicken coupes and corn on the cob, and rhythmic drive merge in this infectiously enjoyable track. This slightly country tune is a heart felt dedication to our mutual good friend Uncle Al, a man who gave Rick a gorgeous 1964 Fender Jaguar one Christmas just because he like the way Rick played. Al has been a long time supporter of surf music, and has always been there for me in my leve recordings and events. His technical exp[ertise and critical ear are priceless. Al is a one of a kind human being I am priviledged to call my friend.